Street sweeping: Essential service or revenue scam? The view from the left side interior of a city of Chicago street sweeping machine. For ease of operation, controls include a dial that measures speed in the range between turtle and rabbit. According to data from the Chicago Department of Revenue, the city has taken in at least $15 million dollars in parking ticket revenue from street-sweeping violations alone each year for the past five years. Editor&apos;s note: We&apos;ve updated this story with answers to follow-up questions you submitted. Sincere thanks for those. Please keep them coming! Street-sweepers. It turns out those zamboni-looking vehicles are some of the most complicated machines in Chicago’s Streets and Sanitation Department. And coincidentally, they seem to be causing lots of complications for drivers (and boyfriends of drivers) across the city. One of those boyfriends in particular is Dan Costalis, a web developer who lives in Chicago’s West Lakeview neighborhood. Dan hasn’t owned a car in about five years or so, but his girlfriend does, and according to Dan, knowing when and where to move her car to avoid tickets during street-cleaning season totally stresses her out. Dan feels like this whole street-sweeping thing might sorta be a scam; perhaps the work is less about leaves, and more about raking in the dough. Now, we here at Curious City can’t change any minds about whether to feel scammed (or not scammed) by the street sweeping service or the related tickets. But we can certainly lay out the facts (there are a lot of them), how the service works, and what, if anything, it does to keep Chicago running well. To understand “what the deal is” (per Dan’s vocabulary), it helps to understand how street sweepers operate, so I headed to the intersection of Erie Street and Milwaukee Avenue on a brisk, fall (or, let’s be honest, early winter) morning in November. There to greet me was one of the city’s 50 street sweepers. This particular machine was decked out with Blackhawks logos as well as the “One Goal” motto that celebrated the hockey team’s 2013 Stanley Cup win. Our driver: Stan Newsome, a seven-year street sweeping veteran. We let our video do the heavy lifting when it comes to how the process works. In it, you can see that Newsome’s ride is equipped with multiple brooms that whisk leaves and debris off the street and into a container. There’s also a little water-sprayer off the side that helps wash away any additional stuff that’s left over. These sweepers take what they collect and dump it into a dumpster before heading to the next section. Multimedia producer Jian Chung Lee caught Newsome’s sweeper miss some things on the first pass, but after the second or third runs there was little left but a few broken leaves. As you can see, too, stray parked cars make the work less effective. But what about the why of the whole operation? Streets and Sanitation Deputy Commissioner Charles Williams offered a short explanation. “[In] Chicago, we maintain very clean streets with these street sweepers,” he said, adding that clean streets translate into cleaner sewers as well — year round. Gross. And, more than that, potentially dangerous. And Williams said there’s no other option or better machine available than a sweeper. They can run year round, except, of course, during inclement winter weather, though you’ll most likely to see them from the spring to late fall. Each sweeper has a price tag of $168,000 and each racks up approximately $40-45 thousand dollars in annual maintenance costs. According to Williams, without sweepers, the city would have to resort to a much more expensive option: manual labor. So, now that we understand why street sweeping happens in the first place, let’s get into Dan’s sneaking suspicion that ticket revenue is in the proverbial driver’s seat. Right now if you leave your car parked in an area that’s going to be cleaned, you can practically guarantee your vehicle will be adorned with a bright, orange $50 ticket. Next year, the city could raise the cost to $60. If this is a familiar territory for you, dear reader, you are far from alone. 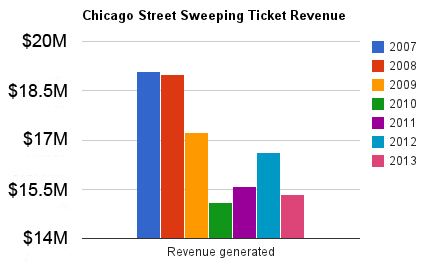 According to data from the Department of Revenue, the city has taken in more than $15 million in just street-sweeping ticket revenue every year for the past five years. So far this year, drivers have paid $15,336,802. That’s about 17 percent of the total revenue brought in by parking tickets this year. And the sweeping season’s not finished; foliage was delayed this year, Williams said, and crews will be sweeping later than usual to grab leaves before the heavy snow comes around. According to city spokeswoman Kelley Quinn, every dollar paid from these tickets goes into the city’s corporate fund, which means the revenue’s not earmarked for anything in particular. So it’s not as if Dan’s friend pays a street-sweeping parking ticket and it goes directly to the Streets and Sanitation guys and gals: It all goes into one pot. To keep that $15 million figure in perspective, it costs the city about $8.5 million a year for street-sweeping itself. Here’s one more relevant detail: The timing of street cleaning is another point of drama for some drivers. Williams says every spring, the city meets with ward superintendents to plan out the sweeping calendar. Schedules are posted online so residents can “plan ahead.” Once it’s sweeping time, the city will post bright orange signs the day before or the morning of to warn drivers of what’s to come. To Dan’s concerns that ticketing during cleaning might be a revenue grab, the city contends that’s not the case. For his part, Dan says all this makes sense, calling the process “uncomfortably logical,” but he is struck by the raw numbers involved. (“That’s a lot of money,” he said). And he also wonders if maybe the city could work a harder to ensure drivers know when it’s time to move their cars. He’s had friends say they parked overnight, only to wake to a signs (and tickets) that weren’t there the night before. Turns out, Curious Citizen Dan Costalis wasn’t the only Chicagoan interested in how the city sweeps its streets. Shortly after we published this story, readers left comments below, hit our Facebook page and tweeted burning questions that we couldn&apos;t ignore. We’re happy to report we hit the airwaves about some of these on WBEZ&apos;s Morning Shift program as well as here. If it’s so important to clean the streets, why wouldn’t the offending cars get towed instead of ticketed? The city says in order to tow a vehicle, it still has to be ticketed first, so there’s no avoiding that. Also, according to Molly Poppe, spokeswoman for the Department of Streets and Sanitation, towing vehicles would require additional staff that the department doesn’t have. Other cities, such as Boston, do tow vehicles for parking during designated street cleaning days. Boston city workers walk around and ticket offending vehicles, just like Chicago does; however, Boston contracts with private tow companies to whisk away any vehicle sporting a ticket. I noticed there’s been a marked decrease in the city’s street sweeping ticket collection since 2010, I wonder what explains this drop. The Department of Revenue wasn’t able to come up with an answer at this time. And since there are a number of factors — and, perhaps, different departments’ opinions — that could play played into this, we’re not on safe ground to say much more. But, we will keep digging! I’ve been told the city can write a ticket every 15 minutes. That sounds like a revenue scheme to me! City spokeswoman Kelley Quinn offered to debunk this myth for us. She says motorists should only receive one street cleaning violation per day, per location. If you do get more than one ticket on the same day, in the same location, Quinn says the driver should contest those subsequent violations. Details on challenging parking tickets can be found here. If they have to extend the street sweeping schedule into December, how do they let people know? This actually happened while we were reporting out this story: The foliage came a bit late this year, so all of the leaves hadn’t fallen by November 30th, the end of the regular sweeping schedule. Poppe says they’ll stick signs up 36-24 hours in advance to let people know. Also, it turns out the city is able to sweep in the winter — weather permitting, of course. Poppe says it’s usually to keep the main arterials clean, so there’s not much parking involved on those streets. But if there is, or if a residential street needs a sweep, Poppe says the signs will give residents a heads up that sweepers are coming. Still shaky on the details? Our listeners and social media followers had a lot of great tips about smartphone apps and websites meant to help ease car owners’ pain. http://sweeparound.us/ came to us via Twitter. Drivers can punch in their home address and the site uses city data to figure out when the next sweeping date is, what sweep area the house or apartment is in, and can even help set the driver up for alerts. Lastly, if you’re a Chicago resident, it behooves you to ask your alderman questions. They might have an alert system set up for you. For example, Alderman Tunney office sends emails and text alerts the evening before and the morning of street sweeping operations within the 44th Ward. Correction: An earlier text version of this story suggested the Streets and Sanitation annual budget was $8.5 million. The department&apos;s budget for 2014 is $216 million, while the budget for street sweeping activity is $8.5 million.